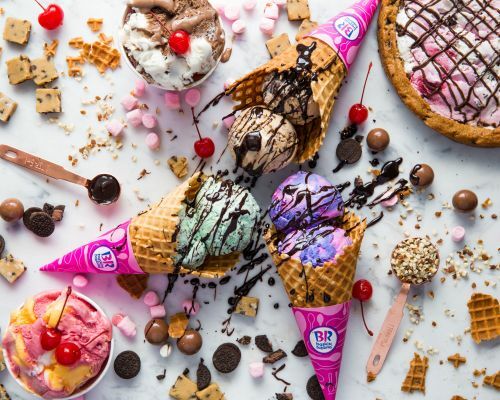 Menulog delivers for Baskin Robbins - Ashgrove so you'll be able to track your courier on a map. An indulgent pairing of 2 x Vertical Sundaes & 2 x Ultimate Shakes. 2 x Large Classic Sundaes and 2 x Kid's Fundaes. More flavours, more fun! Your choice of the world’s favourite ice cream. More flavours. More fun! Your choice of the world’s favourite ice cream. More flavours. Choose between 1 and 3 flavours. More fun! Your choice of the world’s favourite ice cream, hot fudge sauce & sprinkles. More Flavours. More Fun! A warm, golden sticky date cake topped with a generous dollop of salted caramel sauce. A truly decadent dessert when combined with the world’s favourite ice cream. A warm and indulgent brownie dessert. Topped with your choice of hot chocolate or caramel fudge and a scoop of the world’s favourite ice cream. Treat your taste-buds to a warm classic Belgian waffle. Top it with our world-renowned hot fudge and finish it off with a scoop of the world’s favourite ice cream. Mint ice cream loaded with chocolate chips. A double scoop of Mint Choc Chip ice cream served with swooshes of choc fudge sauce & chocolate flake. Vanilla ice cream with lots of cream filled chocolate cookie chunks throughout. A double scoop of Cookies N Cream served with swooshes of choc fudge sauce & mini choc cookies. Vanilla ice cream with praline-coated pecan pieces and a caramel ribbon. A double scoop of Pralines N Cream served with swooshes of caramel fudge sauce & chocolate Kit Kat wafers. Attention Choc Chip Cookie Dough ice cream lovers – delectable milk chocolate plaques adorn this cake, topped with mini choc buttons and delicious cream. Attention Cookies N Cream ice cream lovers – cookies circle the top of this delicious cake frosted with Vanilla ice cream, topped with delicious cream rosettes, drizzled in dark chocolate and edged with a chocolate icing border.